CINEMA: "Acting is like a commodity which depends on supply and demand. Very rarely one finds an actor underplaying his role. Acting is a utility item. Its usefulness keeps on changing to appease the audience demand whose taste could change from time to time. Question: Like most of our film artistes you too had your training on the stage. How do you react to this development today in retrospect? Answer: Yes, a great deal. The stage was my academy of learning. I do not believe in teaching of acting by those who are not trained to teach acting particularly within the context of conditions in our country. Those who teach acting go back to Stanislavskiyan theory of method acting which was his own discovery. It is now out of date, and holds no water today. Method of acting too, changes as everything else. So we can't stick to theories. Q: Can you tell something about the beginning of your career as an actor? A: It goes back to the late 1950s. My ambition was to be an actor. In response to a newspaper advertisement calling for actors, I presented myself for an interview chaired by T. Somasekaran who finally selected me for the lead role in a film. Unfortunately, that film never saw the light of day. Then Sirisena Wimalaweera also selected me for a film and that film too did not come through. So, that reduced my first screen appearance to a very small role in Gam Peraliya. Q: An Indian female film critic had once said that you were the most handsome actor in the South-Asian region. How do you feel about this compliment? A: I did not take what she said seriously. It was her view which could be valid when it comes as a personal assessment of what is beauty. I considered it flattery because for me Ananda Weerakoon was the most handsome actor. Q: Film goers think that your performance in Delovak Athara is still your finest performance in the cinema. What have you got to say about this recognition? A: The entire credit for my performance in Delovak Athara should go to Dr. Lester James Peries. When I was acting in that film I was just a lump of clay in his hand. It was a complex role which gave me a boost in my career in cinema. Q: Since you are being loved for your heroic character roles, how do you react to your anti-heroic or villainous roles in certain films like Ran Salu? A: The nature of the character I was to portray never bothered me. In Ran Salu I was the villain and I loved that role very much. For me a character is neither heroic nor villainous. They are only characters which the actors have to portray. There are no such things as character roles or character actors. Every character is a role and every role is a character. I never wanted to build a particular screen image. I liked varied roles and what mattered for me was the performance. Q: Have you ever been inspired by any local or foreign actor? A: Yes, I was inspired by Laurence Olivier. Although I was a super-fan of Dilip Kumar, Olivier's performance in Rebecca, Wuthering Heights and Hamlet really fascinated me. I do not consider Marlon Brando as a great actor although his performance in Water Front, God Father and The Wild Ones is admirable. On the local scene, I recollect with deep gratitude the memories of Gamini Fonseka and Dr. Lester James Peries. In fact they were instrumental in shaping me as an actor. Q: How do you face the challenges offered by different audio-visual art forms in which you have performed? A: First the stage and then cinema. Certainly it was a challenge. At the commencement of my career I was callous in my approach to the profession. I have acted in more first-director films than any other movie actor. Television does not offer any challenge as such because most of the viewers of teledramas are not serious and watch them in a much more relaxed mood. However, whatever the performance one must be very sincere to his job. It is regrettable that such eminent film actors like Laddie Ranasinghe, Michael Sannas Liyanage, Dr. Nanayakkara and Dommie Jayawardena were not recognized. I may recall an incident which goes back to the Tower Hall Theatre days when once an English actress who had watched a male actor performing the role of Juliet In Romeo and Juliet was so thrilled by his performance that she presented her necklace to that male actor. Q: Apart from being one of our best actors today you are a leading script-writer too. How did you switch your role from that of acting to script-writing? A: I have read profusely on script-writing and in addition, I was fortunate enough to have worked with all the good Sri Lankan film directors to whom I, have been very close. That was my advantage in undertaking film scriptwriting. I was always enriched by their suggestions and ideas which I did not hesitate to make use of when I was writing a script. Q: What satisfies you most, acting or script-writing? A: Undoubtedly acting, because I came in as an actor and script writing is secondary. I remain primarily an actor even while taking to script-writing which I began much later in my life. That too is at my leisure and pleasure. Q: As an artist who had won several awards in recognition of your excellence in performance, which of them do you value most? A: I rate my performance in Pawuru Walalu as my best though I did not get an award for it. The first ever award I won was for my performance in Ahasin Polowata. My view is that acting cannot be judged by a panel of judges constituting 5-9 members. I have never won a Sarasaviya film award. But, I have never blamed any jury because I know that they are doing a thankless job. Charlie Chaplin the celebrated actor and director once said, "To be a good actor, one needs 75 p.c. luck and 25 p.c. talent", which really means that actors are born rather than made. Q: Can you explain the significance of an award for an artiste? A: For any artist an award is a reward in recognition of his performance. It is an encouragement and a symbol of achievement. However, as you grow old awards do not matter much. Q: What is the difference, if any, between acting in the fifties and today? A: Acting is also like a commodity which depends on supply and demand. Very rarely one finds an actor underplaying his role. Acting is a utility item. Its usefulness keeps on changing to appease the audience demand whose taste could change from time to time. Today there is a buoyancy in acting, a thing we did not have in our youth. The actors then were very serious and were always playing to the audience. Q:What motivated you to translate the biography of Dilip Kumar into Sinhala? 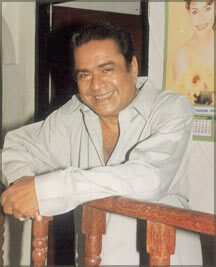 A:I have been a fan of Dilip Kumar since my youth, and put him on the highest pedestal. He is very attractive. In the fifties he was even more popular than Nehru, the Prime Minister of India. A lovable personality, his influence was seen all over India. His is a life story that one should certainly read. Q:What plans have you got for the future? A: Nothing in particular. I want to write a couple of biographies. And, I want to concentrate more on writing even though I have reduced my acting for the cinema and television.